“It’s the most wonderful time of the year” according to Andy Williams and “the most beautiful time of the year” sings Justin Bieber. It’s also the time of the year that some of us realize we should have bought a new snow blower. One reason you should buy a snow blower before it snows is that they sell out whenever a major snowfall is announced. It is also better to be ready to clear the snow before you have a mountain of snow on the driveway. You could also buy last year’s model at a bargain price at the end-of-season sale and save money. That would mean you are ready for the next snowfall. However, you can be the guy who is waiting. During mid-winter, there are plenty of snow blowers to choose. It is also when prices are not that good, especially when a storm is on the way. Conversely, prices will turn in your favor when the winter turns out to be unusually mild, and the snow isn’t falling like it usually does. It is something that happens more often, and nobody wants to buy a snow-thrower that is just going to sit around doing nothing. The point of owning a snow blower is to clear snow before it piles up. Warnings that snowfall is in the air should prompt you to prepare your snow thrower so you are ready to clear when the snow comes down. Clear the snow when you have about six inches of snow piled up in the driveway. Imagine not owning one when the snow is piling up, and then you find that the local dealers have no stock. That’s when you realize the importance of preparing ahead of time. You may need to clear a 1 or 2-car driveway, a deck and minimum walk area. if you live in an area with a mild dry and fluffy snow, you could consider a small, single stage thrower. These small single-stage machines work best on snowfall from a half-inch to 9 inches of fluffy, dry snow. They move up to 1000 pounds of snow per minute, and weigh around 35 to 70 pounds. These snow throwers are available as electric and cordless models. To clear a wide driveway, a large deck and some walkways, consider a medium-size, single-stage thrower. These snow throwers can tackle snow up to 12 inches deep and throw 1,800 pounds per minute or more. A medium-size, single-stage thrower is used to clear dry snow and clears a path 18 to 24 inches in width. These machines can throw the snow up to 40 feet. Medium size single-stage snow throwers weigh 70 to 131 pounds. These machines are available as gas, electric and battery powered, and come with some luxury features like headlights and grouped controls. You need a two-stage blower for a three-car driveway with lots of walkways. Or if you live in a heavy-snow area with wet snow. This is a heavy-duty snow blower and better at cutting through compacted and wet snow. Entry level two-stage blowers can handle snow up to 24 inches wide and 23 inches deep. They can have luxury items like halogen lights, hand warmers, electric start, a drive system, and power steering. These snow blowers handle up to 12 inches wet snow and throw 2,200 pounds per minute and more. We review nine gas, electric and cordless (battery) snow blowers. As you work through the list, it will become clear which one is the best snow blower is for your needs. The Husqvarna ST224P is a two-stage snow blower, gas driven and with electric start. They developed it for homeowners who need a high-performing snow blower. This snow blower is ideal for large driveways and paths. It’s a great machine to use with wet snow, but is suitable for all snow conditions. The Husqvarna 208cc four-stroke engine delivers 6.3 HP. It is powerful enough to cut through wet, heavy snowfall of 2-12 inches. The Husqvarna’s working width is 24 inches with 23 inches depth, but expect to operate at a slower pace when handling wet snow. Do not to push the machine beyond its limits. There is no pushing a self-drive snow blower. If the snow blower rides up onto the snow, you need to reduce the forward speed. Another option is to release the traction drive control lever for a short while to allow the blower to catch up and clear the chute. The Husqvarna has six forward speeds and one reverse. Some users complain that the reverse is too slow. However, keep pushing forward, pausing when needed. This way, reverse is seldom necessary. Therefore I do not believe it is much of an issue. The transmission is a Friction Disc type that ensures smooth operation. This snow blower is big, and it weighs 198 pounds. You will appreciate that it is self-driven. The power steering is excellent. There is a lever on each side of the handlebar that disengages the wheel on that side. You turn in the direction of the lever that you pull, only the wheel on the opposite revolves. These are fingertip controls and are easy to reach whilst using the traction and auger controls. The lower gear and power steering make it easier to drive the machine up or down ramps to load onto a truck. You can adjust the handles on this Husqvarna, using four positions to suit everybody. The human comforts list also include heated handles, all the controls are within easy reach, and are covered with soft rubber grips. The two LED headlights provide good lighting which comes in handy when you work at night or early morning. You have a lever to control the chute deflector, forward and reverse speeds, and the chute rotation handle. A cleanout tool to clean the chute clips to the machine, so it is always within easy reach. You can adjust the skid shoes up and down to control the clearance of the scraper bar from the ground. By raising the scraper bar, the machine is not affected by undulations in the ground surface. You can readily replace the shoes should they become worn. The safety ignition key, electric start, fuel primer choke control, are all placed on and around the engine. The handy electric starter uses grid power. The snow blower has a 120V socket that you plug into an extension cord in order to use the starter button. It works well with the advantage that you do not have to deal with a frozen battery. A throttle switch selects fast or slow engine speeds. However, you always operate the snow thrower with the engine at full throttle because it offers the best performance. The slow run mode is used to thaw the engine after the snow blowing task. The traction drive control lever locks the auger control lever in position when you engage both traction drive and auger control levers, so that you don’t have to hold them continuously. This allows you to adjust the discharge chute direction without interrupting the snow throwing process. The chute rotates 180 degrees left to right and turns up/downward enough to give you lots of throwing options. According to user feedback, the traction and auger controls work well, and the chute controls shift effortlessly. Best snow blower for wet snow. Two-stage snow blower with a 24-inch clearing width. ✓ View or download the BROCHURE for the Ariens Sno-Tek — 920402. Like the Husqvarna ST224P, the Ariens Sno-Tek working end is made from metal to ensure a long life. The two machines are comparable; both are two stage snow blowers, well-suited to heavy snowfalls and clearing large driveways. It will clear light, fluffy snow and heavy wet snow well. The only difference is in the lower of the six speeds when dealing with heavy wet snow. The Ariens is heavier than the Husqvarna; it weighs 204 pounds. Its clearing width is also 24 inches, and the intake height is 20 inches. It has all-steel serrated augers that cut into wet or compacted snow with ease. It moves the snow inwards towards the high-speed impeller to be blown up to 40 feet. You control the polymer chute with a quick-turn lever, and it has a 205° rotation to throw the snow where you want it. Because the control levers interlock, you can control the chute from the dashboard with one hand while still operating the machine. Frymark Fulfillment LLC manufactures the Ariens range, and the Sno-Tek is powered by a 208cc engine that delivers 6.5 horsepower. It’s a four-stroke engine manufactured by LCT for Sno-Tec snow blowers. It’s the same size and delivers almost the same power and torque as the Husqvarna engine. These two 2-stage snow blowers are excellent machines if treated well but they need regular maintenance. Allow the machine time to run after use to dry its engine, then you dry the whole blower before you store it. This prevents rust forming where paint chipped off. You insert a 120V plug into a power receptacle on the machine and press the button to start the engine. As a backup, when an electric outlet is not within reach, you use a conventional recoil starter. The electric starter is handy on those cold winter days when your engine refuses to start. You manually operate the choke and a fuel shutoff valve when starting the engine. The Ariens has no headlights and also does not have power steering or heated hand grips. It surprised me to see that it is more expensive than the Husqvarna which has all these features. There’s some negative feedback that all seems to relate to service issues. Many customers have complained that the Ariens will not start when the second season arrives. This is a clear sign that the fuel in the lines have gummed up. I always recommend using good quality fuel and adding a quality fuel conditioner. When you prepare the machine for storage at the end of the season, drain the tank and run the engine until it stops. That leaves the carburetor and fuel lines empty, and there is no gumming up. I could not determine the snow moving ability of the two 2-stage snow blowers, given as snow moved in pounds/minutes. It is available for the single stage snow blowers, and I use it as a comparison between the machines. Starts easy – even in cold weather. Powerful, easy to start, fuel efficient Honda engine : Honda GC190 OHC premium residential engine offers plenty of power to churn through the snow. Starting is easy – even in cold weather. 4 stroke engine – No mixing gas and oil. No mixing, no two-stroke smoke and stink, lower emissions, and better fuel economy. Honda uses a rugged, durable metal auger with replaceable rubber paddles to make quick work of residential snow removal. Auger assist drive helps move the HS720 when the rubber-edged auger contacts the surface. A gentle upward pressure on the handle starts forward motion. Don’t let its small size fool you. The HS720 has the snow-clearing power of a snow blower twice its size. Easy to adjust distance of snow discharge : Move the Snow Director control up and down to adjust the distance of snow discharge. Reliable, rugged construction featuring a bearing supported auger. The ignition switch, manual choke, starter grip and fuel cap are conveniently located for easy access. Starter grip is extra large to accommodate gloves or mittens. The access panel allows easy and safe operation, even with gloves on. Fuel shut off valve for safe storage. Designed for ease of maintenance. Draining the engine oil and fuel are easy, saving time, frustration, and mess. The spark plug is very easy to access for replacement. Automatic decompression for easy starting : Relieves compression in the engine during starting and then closes automatically to ensure full power after the engine starts. The Honda is an interesting addition to our mix of gas-powered snow blowers. It’s a single stage 20 inch snow thrower. Keep in mind that Honda also manufactures two-stage snow blowers, clearing up to 3000 pounds of snow per minute. This one moves 1833 pounds/minute, a remarkable achievement for a single stage snow thrower. What I find intriguing is that the auger of the Honda HS720AA looks more like a corkscrew than a typical single stage snow paddle. The Honda auger is constructed from steel which support replaceable rubber paddles, shaped like the blades on a two-stage snow blower. The rubber paddles shift the snow closer to the center steel paddles with rubber tips that throw the snow out. When the rubber-edged auger paddles contact the surface, they tend to pull the snow blower forward. Honda calls this “auger assist drive” that is activated by a gentle upward push on the handle bars. It means that there is friction between the paddles and the paving, therefore the paddles will wear down in time. User feedback is positive and confirms the manufacturer’s claim that it throws the snow 30 feet, even when clearing wet snow. The Honda is a light machine and weighs only 88.8 pounds compared to the 206 pounds of two-stage machines. It is therefore easy to move around and, when started on dry paving, the auger assist can make the Honda move forward unexpectedly. It is easy to control but something to be aware of to avoid any harm. The 187 cc four-stroke engine has a 1.29-gallon fuel tank and Honda engines are known to be fuel efficient. User feedback is positive with users reporting that they can clear snow for an hour without stopping for a refill. It should provide enough fuel to clear a large driveway and walkways. The Honda engine automatically lowers the compression in the engine, making it easy to spin the engine with the recoil starter. The decompression valve closes after the engine starts so that it can deliver full power. There is no electric start, no lights or any luxury features. The only controls on the handlebar are the auger clutch and the two chute controls. Its clearing height is 12 inches. This is better than most single stage snow throwers and the Honda also clears down to the pavement or deck. The metal auger housing is a plus point in my book; it will last a long time. When wearing gloves or mittens, all the controls on the Honda are still easy to use. We are leaving the snow blowers behind and are now looking at the snow throwers, single stage machines with paddles. Some of them are electrically driven (corded) and there are three cordless snow throwers. I wish to make one thing clear, the snow throwers dislike slushy snow. The chute clogs in the slushy mix at the end of the driveway. It will clear powdery snow up to two feet, but it works best with about 8 to 10 inches of dry powdery snow. Snow throwers are light, small, and easy to carry. If you’re looking for something to clear a 100+ foot two-car driveway, consider a larger gas, two-stage machine. For smaller jobs, or with a little creativity snow throwers will work fine if you work within its limitations. 13.5-amp motor blows snow up to 20 feet away. An interesting problem I picked up from Wen user feedback is that you must make sure you use a separate home circuit for your tools. This electrical circuit must not be less than a #12 wire and a 15 Amp time-delayed fuse should protect it. The Wen electric snow blower uses over 15 Amps when starting up and runs at 13.5 Amps. Sharing the circuit with anything else is sure to trip the supply. The WEN 5662 Snow Blaster can clear up to 10 inches dry snow. Although some users reported using it to clear away 2 feet of snow, I do not recommend doing this. It requires bumping into the snow a few times before you can clear the area. The best way to attach such a load is to use only about 6 inches of the auger’s width and to move slowly. The Wen is the first of the snow throwers that I can compare to the Honda’s 1833 pounds per minute snow moving ability. The Wen can throw 490 pounds per minute. Yes, it’s only 27% of the Honda snow thrower’s capability. But keep in mind that a powerful 187cc gas engine drives the Honda. Some buyers are concerned about using electricity in a wet environment. Dragging an extension connector through water and mud is dangerous. Make sure you buy a long enough cold weather extension cord that will cover the entire area with ease. Don’t connect one extension cord to another, it is dangerous and is exposed to the wet snow. Use a long enough extension cord and wrap the power cord connection in some plastic to keep the damp out. The Wen Electric Snow Blower can clear a path up to 18 inches wide and keep on doing so all day without stopping for Fuel. It has none of the drawbacks of a gas snow blower, no oil and gas spills, and no starting and storage issues. It is great for clearing a large deck, medium-sized driveway or footpaths. It is light enough to pick up and carry up a flight of stairs; it weighs only 32 pounds. It is also easy to clean after a session. One thing I am concerned about is its almost all plastic design. Although it looks sturdy and works well. The auger rotates at 2000 rpm, and throws the snow up to 20 feet away. You change the direction of the chute through 180° with a convenient hand crank. A quick-adjust system simplifies vertical angle adjustments. Always avoid blasting the snow at people, animals or the neighbor’s driveway, if possible, blow with the wind. Do not expect to find headlights, heated handlebars, drive-assist, or any such advanced features. The machine is purpose-built for clearing up to 8 inches dry snow. The Wen Snowblaster has a two-year warranty and a nationwide support network. For clearing snow off mid-to-large sized driveways and walkways. The SJ623E can move snow up to 720 pounds per minute using a 15-amp motor. Compare that to the Wen’s 490 pounds per minute, and you already see a remarkable difference. The Snow Joe Ultra SJ623E has a durable, heavy-grade steel auger with four replaceable rubber blades. It cuts an 18-inch wide by 10-inch deep swath of snow with each pass. The Snow Joe Ultra SJ623E is ideal for clearing snow off mid-to-large sized driveways and walkways. Electrically driven snow throwers have the advantage that they are always ready for use. You must ready gas snow throwers for the snow season to be sure they will start and run. Electric snow throwers run when you pull the trigger. Some users use it to clear dry snow over a foot high. They say you only need to move slowly and often let the machine cool down. Where the plow truck piles up snow laden with road salt, the Snow Joe bogs down a little. Use a good quality extension cord rated for outside use in winter. A standard cord works fine, but coiling it in 8°F weather is difficult, and it may crack the insulation. Make sure that all connections are good so you don’t lose power and overheat the motor. With bad connections, you may even smell the motor, a sure sign that something is wrong. That’s when you get an electrician to check your electrical supply. The 20 Watt Halogen light at the top end of the housing works well according to people using it in the dark after work. The chute is adjustable through 180°. You rotate it with a crank handle and adjust the chute deflector by loosening the deflector knob so you can adjust it by hand. The rubber tips of the blades are replaceable by removing them from the metal supports. The scraper bar at the base of the machine, beneath the rotor housing, can be replaced when needed. You can replace the two skid shoes at the bottom of the side panels by taking out the screws holding them. It is about the full extent of maintaining an electric snow blower apart, maybe, for cleaning and checking all bolts and nuts. The wheels are small (7 inches) and, according to some users, causes the scraper to get stuck in irregularities on the driveway. The machine is light enough to carry upstairs to clear the deck and other elevated areas. The Snow Joe SJ627E is the last in our list of electric snow throwers. It is the bigger brother of the Snow Joe Ultra SJ623E, and is able to move 833 pounds per minute. What surprises me is that a 15 Amp motor powers it, like the SJ623E, and the design seems similar. To increase capacity, they widened the snow scoop to 22 inches. The auger speed is also higher; they moved it up from 2450 rpm to 3000 rpm. More power is available for the motor by replacing the 20W Halogen light with two energy-efficient LED lights of 3 watts. The throwing distance of 25 feet is 5 feet further than the SJ623E. This model is ideal for clearing snow off larger driveways and walkways. Yet it is still a light machine, weighing a mere 34.6 pounds. You can carry it onto the deck and be confident that it will not damage the surface. The replaceable scraper bar protects the pavement or deck by preventing the auger from making contact. Both machines have 7-inch wheels, so they share the same problems when used on paved driveways. Bigger wheels would be an advantage. Its steel auger has the same design as the SJ623E, but is wider and it also has replaceable rubber tipped blades supported by steel blades. The SJ627E works best in dry snow up to 13 inches deep. The two replaceable skid shoes are of the same design, they seem a little fragile and are not reversible. From customer feedback, the biggest problem seems in coping with the cord. It’s best to clear a path down the one end of the driveway to the pavement. Pull the cord out of the way and coil any access midway down the driveway. Then you work your way to the other side of the driveway, always keeping the cord on that side. The controls for the chute are the same as the SJ623E. The light switch is also in the same low position, you reach down to use it, but it is a great aid on a dark driveway. All three cordless models are Single stage snow blowers or snow paddles. These machines are as powerful as the corded electric models, some are even more powerful. Battery driven snow blowers use brushless motors and can be as powerful as entry level gas models. The main advantage is that you do not drag a cord behind you, making it fully portable. The drawback is that its performance is limited by the run times of the batteries. Easy for anyone to use for light snow up to 8 inches. The Earthwise SN74014 Cordless snow shovel deviates from the snow blower theme. It’s easy to use with one hand, and the handle looks more like it belongs to an edge cutter. The Earthwise SN74014 electric snow shovel weighs only 16 pounds. It’s light and cordless, and there is no chute to direct the throw. The auger scoops the snow and throws it out the front. To guide the snow throw somewhat, you use an adjustment lever to turn the direction fins to the left or right. The snow shovel can throw the snow up to 32 feet away. It’s effortless to use on decks, steps, patios, sidewalks, and small driveways. This snow shovel moves 300 pounds per minute, 61% of what the little Wen 5662 can do. It clears a 14 inch wide cut up to 8 inches deep. You will only use it to clear light dry snow, but it beats using any old snow shovel. It’s easy to carry up steps and even lift to reposition it when clearing snow. When the work is over, it is effortless to clean and store away in a closet. The controls that direct the throwing path of the snow has limited control over the snow, therefore you have to plan your clearing task. The snow is not directed into a chute and thrown to one side of the snow blower. Instead, it is thrown from the auger, creating a lot of powdery snow thrown over a wide area. The directional fins direct the snow about 5 to 10 degrees to the left or right. Always work with the wind blowing from behind to assist the blower or you will get snow on your face. The plastic auger does not stand up to wear well. You should not use it where hidden rocks, broken branches or frozen newspapers can be picked up. Some feedback shows that pieces of the auger can break off. The Earthwise is delivered in a box and must be assembled first. The battery and charger are in the box too, the battery must be charged before you use it. If you follow the manual, assembly should be straightforward. 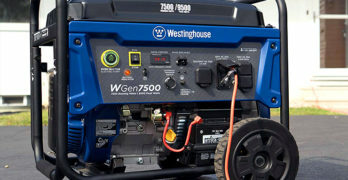 The 40-Volt 4Ah battery takes about 150 minutes for the initial charge. It’s a sign that the battery will charge faster during use because some charge remains. If you find the run-time too limiting, you may have a spare available. Battery runtime is from 25 to 40 minutes, enough time to clear a deck, driveway and the sidewalk. The machine is quiet enough to be used at any time of the day without disturbing the neighbors. You can even use it three o’clock in the morning as one user pointed out. Featuring exclusive EcoSharp technology for no fade power. iONMAX iBAT40-LT and ICHRG40 included. The iON in the name of the Snow Joe iON15SB-LT indicates that it uses the iON 40 V Eco Sharp Lithium-Ion battery from Snow Joe. It’s a single stage snow thrower that’s best used to clear small driveways, sidewalks, and walkways. Its clearing path is 15 inches wide, and it will clear snow up to 8 inches deep. With a maximum plowing capacity of 441 pounds per minute, it’s less than any of the corded electric snow throwers. This Snow Joe will throw the snow over a maximum distance of 20 feet. It is a light, compact machine that’s easy to move around and you can carry it upstairs to clear a deck. This snow thrower weighs 20.9 pounds with the battery installed. The brushless motor requires no maintenance and should last a lifetime. The 40 Volt Lithium-Ion battery has a capacity of 2.5 Ah. The Snow Joe can run on one charge for 30 minutes maximum when clearing light, fluffy snow. Recharging the battery will take 1.5 to 2 hours. Most of this machine is plastic. The no-load speed of the 2-blade cold and abrasion-resistant plastic auger is 1700 rpm. The 30 minutes run-time can clear most driveways, sidewalk, and the deck. Directional control of the adjustable chute is up to 180° side to side with a crank handle. It is within reach without bending down. To adjust the throw distance, you have to get down to the chute, undo the adjustment knob and manually adjust the chute deflector. A handy feature is a foldable handle that lets you fold it into a compact unit when storing it away. The 6.3 inch wheels on this Snow Joe are a little small, in my opinion. When used on a pavement with joins, the wheels drop into the joints. This causes the scraper bar to get stuck. You have to lift the snow thrower a little to free it, and users find it irritating. The obvious solution is to cross these joins at a slight angle which means planning the path better. Includes : Two (2) 5.0 Ah batteries and the Rapid Charger. Throws snow up to 35 ft.
With two batteries it is different to the other cordless snow throwers in our lineup. The two batteries of 56 Volt each and a brushless motor provides more power and enables the EGO to cut a path 21 inches wide. The two batteries and higher voltage to the brushless motor give it more torque, and therefore it can even handle some wet snow. But it remains a single stage snow thrower with a two-paddle rubber auger. Its primary purpose is to clear light, fluffy snow. It will not cut into the heavy wet snow like a two-stage snow blower. Although it will be able to clear the mess left behind by the city snow plow. The auger speed is adjustable and allows the snow blower to throw the snow up to 35 feet. The chute adjuster is fitted to the handlebar. You can adjust the snow throwing direction through 180° left to right but you need to reach down to the chute deflector to adjust it up and down. It’s a one-handed operation because the chute has a handle with a release trigger to make adjustments convenient and fast. It’s another snow thrower with two LED headlights for working in dark areas. It will be handy when you have to clear the driveway at night or when leaving early in the morning. The steel chassis ensures that the construction is robust, so that it will last a long time. Even though it adds to the weight of the machine, I prefer a metal chassis. The EGO Power+ comes with two batteries and a charger, the minimum charge time for a battery is 40 minutes. One important consideration is that the batteries could fail in really cold weather and therefore the batteries must be kept and charged inside. The charger will charge the batteries and then switch over to standby mode. Its 7-inch wheels are not much bigger than the Snow Joe models, and are still a little small. The scraper bar is easy to replace when you turn the machine on its side. Because this is a battery-driven snow thrower, there is no fuel and oil that can run out onto the garage floor. The machine is light and can be picked up onto a workbench with ease. The auger design uses two shaped rubber paddles that scoop up the snow, and it clears right down to the paving or driveway. There is no steel backing for the rubber paddles. It offers them some flexibility to absorb the shock of picking up a bottle or rock without harming the unit. What exactly is wet snow? Wet snow feels wet, and it’s compactable. It’s a fantastic temporary construction material, perfect for making snowmen, snow sculptures and for snowball fights. The liquid content determines the wetness or dryness of the falling snow. When the ambient temperature is just above freezing, some snow melts and falls as wet snow. Because the wet snow lacks a crystal structure, it is heavy and can pack together in some areas of the snow blower. Dry fluffy snow with low liquid content forms when the temperature is well below freezing. Dry snow or powder is powdery. It gets blown around by the wind and it’s not sticky. It’s fluffy and not compactable, perfect for powder skiing. Champagne powder is the lightest and fluffiest with the lowest moisture content. You cannot make snowballs with dry snow. During the day, even in cloudy conditions, some sunlight passes through clouds. The falling snowflakes absorb some of this sunlight, melting the flakes. It makes the snow wetter, even at temperatures well below freezing. Snow on the ground absorbs the solar energy of the sun, even when temperatures are well below freezing. These conditions cause snow to become wetter. After sunset, there is no heat. Therefore, snow falling at night is drier, especially when the temperatures are well below freezing. If the ground conditions are warm or wet, some or all of the snow melts after it reaches the ground. It makes the snow wetter. At night, when temperatures fall below freezing, the liquid content of snow on the ground tend to freeze up. Hard pack Snow is firmly compressed snow that is almost icy. This stuff is difficult to move. This is when you need a two-stage blower; the single stage paddles won’t do. Why single stage snow blowers don’t work well with heavy wet snow? The auger of the single stage snow thrower looks more like curved paddles that collect the fluffy snow. Plastic and rubber-faced paddles are often used, and the machines have a blade that scrapes the paving. It paddles the dry snow in at high speed. At the same time, it throws the snow into and out the chute. Single-stage throwers use less powerful motors than two-stage blowers. When you push a single stage thrower into heavy wet snow, you may become frustrated. You will need several attempts for one pass, and it is heavy work. The chute will often become packed with wet snow that must be cleared out. The whole process becomes cumbersome. The snow thrower will not endure this type of treatment, and those plastic paddles could break. Which snow blower type is best for wet snow? The best blower type for wet snow is the two stage blower. Snow blowers meant for wet snow do not use paddles. The auger of the two-stage snow blower works like a corkscrew that slices into the wet snow with serrated edges. It has an open blade design without paddles, meaning the snow that is cut loose is moved to the mouth of the blower. The high-speed blower further breaks up the wet, often compacted snow and blows it out the chute. It is heavy work, so snow blowers are heavy machines and therefore self-driven by a friction drive. The machine is most effective when dealing with heavy wet snow, but it will clear powdery snow. Because it’s dealing with wet, sometimes dirty snow, the wear and tear lead to flaking paint that exposes the steel, leading to rust forming. Therefore, you must maintain the machine well and fight rust to extend the working life of the machine. Prepare the machine so that it can better deal with the snow. Do so before the season starts but it’s worth repeating during the season. Always sand any rusted areas, prepare the surface with rust converter and repaint them. Then apply high-quality polymeric car wax to all painted surfaces to help shed the snow and water and protect the paint. Please don’t forget to wax the entire inside of the chute and then spray it with a good quality silicone. Also spray the inside bucket area, the top, back and sides of the bucket. Spray all the augers, shaft, gearbox, impeller area, impeller fan, and exit hole. It helps that the snow and slush do not stick to the components. The drive shaft applies torque to the auger through the shear pins. If you neglect the snow blower, the auger rusts to the drive shaft, and the shear pins will never break. Then, should the auger clog, it can seriously damage the snow blower. Therefore it’s wise to lubricate the entire drive shaft. To do that, you remove the shear pins and lubricate the drive shaft with lubricating oil. Any good type spray oil will also do. You can rotate the auger a few times to spread the oil and then reinstall the shear pins. Don’t wait for the snow to stop, even when you get blasted with wet, heavy snow, clear before the snow reaches 8 inches. The snow thrower will be more effective, clear the area faster and will not work as hard. When the snow is extremely heavy, you reduce the width of snow that you remove by overlapping your previous path and reduce your pace. To get maximum throw, you take smaller bites; about one-third to one-half the width of the machine. Run the blower at top speed, but keep the ground speed slow. Use the blasting wind, blow with the wind and adjust the chute diverter to its raised position. It takes a long time to stop, switch the engine off, and unclog the chute. Ramming ahead at full speed saves no time. Early morning is the best time to remove snow because it is still dry and unaffected by the sun and warming temperatures. Always keep the engine clear of snow during use. It will extend engine life due to the improved flow of cooling air. After completing the snow throwing process, let the engine run at a slow speed for a few minutes. The heat of the motor or engine will melt the snow and ice off the power source, extending its life and saving you money.